Fitness trackers. Cars. Washing machines. Lightbulbs. Cameras. Nest might only really make two products, but it's spent the past year building up a sprawling ecosystem of devices and companies that can function in tandem with its products. Today it announced five more—as well as its acquisition of the connected home system Revolv. 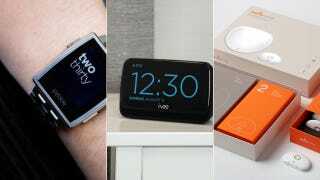 According to the Verge, Nest is buying Revolv and discontinuing its hardware products to focus on the company's software. It seems that Revolv is a way to add a stable, flexible platform to Nest's library of products—a smart move, since Nest is adding more and more Nest-compatible product partners to its roster. "We are not fans of yet another hub that people should have to worry about," Nest's Matt Rogers told Re/Code. Rather, he said, Nest is interested in the Revolv team's expertise in general. It's been almost five months since the company launched Works With Nest, a developer program aimed at connecting outside companies to Nest's products. Rather than build a dozen new products themselves, Nest seems to be taking the tack of uniting other viable companies under its loose umbrella—a smart strategy, considering the challenge of building a stand-alone smart home product line, like companies such as Wink are pursuing. So who are the new additions? There's Rachio, the smart sprinkler system, which is a natural fit for Nest's efficiency-minded ecosystem. And Ivee, a voice-controlled home assistant, will bring voice activation to the Nest family. Then there's WallyHome, a leak and moisture detection system that will also pair with Nest to bring finer detail to its reading of your home, thanks to its network of moisture and temperature systems. Life360, a free app that let families track members via smartphone locations, is also joining the Nest team. This is a smart integration—an ambient way to track who is in the house and when. This way, when the last family member leaves, Nest will know to turn off the A/C. Or you could program your Nest ecosystem to respond to where in the home your family is at the moment. Perhaps the most notable new partner is Pebble, which has spent some time as the reigning smartwatch king. Leaf, a Pebble app that's been around since earlier this year, is finally supported by Nest itself—which means users will be able to check the temperature in their homes, and control it, via their Pebble watches. It's a load of new functionality, and it'll be fairly easy to set up your own system for connecting it all. Especially since Nest, in its infinite wisdom, is already including IFTTT in its partners.